Alaia's collected 2,444 plastic bottles in one week. 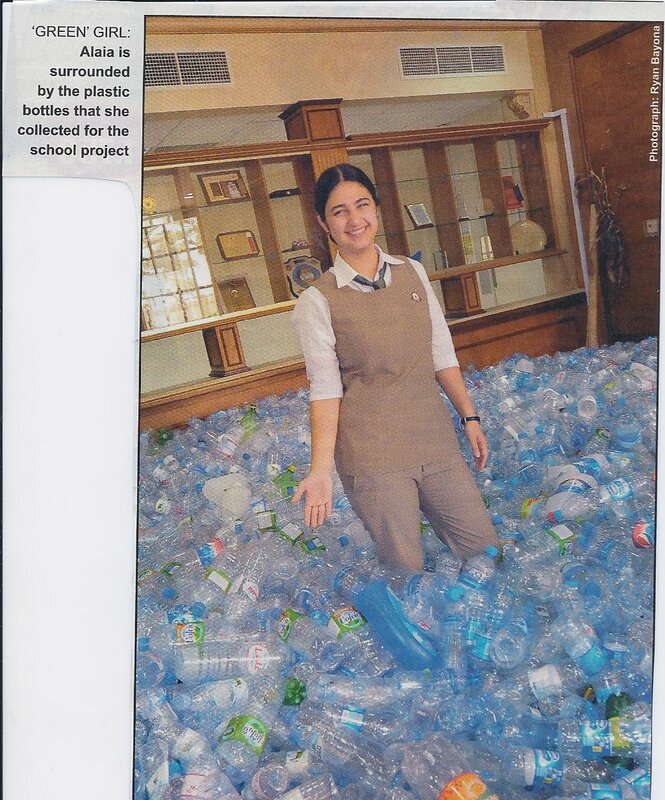 Yeah to Alaia and her schoolmates for attempting to collect 10 tonnes of plastic bottles to buy ten wheelchairs. The 120 students turned in over 20,196 plastic bottles to the recycler. But – my heart was broken by the piles of plastic bottles around her. Alaia alone collected 2,444 water bottles in one week. If this is a fraction of the bottles generated weekly in this country of 1.2 million, then how many water bottles are opened and tossed out daily worldwide? As a comparison, once I supplied bottles of water for the 20 students in our Reiki class. At the end of the day, 16 bottles from the case of 24 were opened, sipped from and left nearly full as trash under the chairs. This was a group of adult healers working to raise their consciousness. I remember listening to a NPR interview with Dr. Jeffrey Meikle. He had written a book celebrating plastics on its 100th anniversary. Dr. Meikle rhapsodized over the thousands of plastic innovations. When Norris, the interviewer, pressed him about the environmental concerns, Dr. Meikle pulled out the patriot card saying plastics were democratic because it allowed millions of people to buy cheap things they could not normally afford. Norris pressed him again. NORRIS: But Professor Meikle, there’s no denying that tons and tons of these products remain in landfills all over the world. Dr. MEIKLE: That’s right. And they will remain there, basically, forever. I suppose that it’s very similar to what you do with nuclear waste. What do you do with plastics? We are creating things that we will never be able to get rid of. And I suspect that that is the major problem with plastics. The flaw in his comparing nuclear waste and plastic is that millions of people don’t have access to cheap nuclear energy like they do to cheap plastic consumer products. Secondly because plastics are so cheap, we simply discard them when we are done and buy another. Every year it takes a day to repack all of my Christmas ornaments. My Filipino helper asked me, “Why don’t you just buy new decorations? In my country, we throw out our tree and decorations and buy new ones the next year.” I was shocked because this was coming from someone who, relative to us, made very little money. Her point was these things are so cheap why save them? Each of us must take responsibility for our plastic bottle usage. 1) Bring your own re-useable bottles. 2) Return to the old practice of filling IGLOOs with ice and water and supplying paper cups at parties, meetings and sporting events. 3) When you buy think QUALITY, not quantity. My mother used to tell me it was better to save your money to buy something of quality. You might have fewer things, but the things you have will last longer and you will appreciate them more because you had to wait for them. Each of us needs to reduce our plastic usage so Alaia has to figure out a different way to buy a wheelchair. a great author.I will make certain to bookmark your blog and will often come back later in life.